Why Did Shakespeare Write Richard the Third? Conventional wisdom states that the play Richard III is merely a piece of Tudor propaganda with little in the way of historical accuracy. This, though, is a view taken by a modern audience. Shakespeare’s playgoers were Elizabethan when the play was written around 1593-4 and they had a very different mind-set, one that was bound to be influenced by their contemporary politics. At this time, William Shakespeare was a young actor who was struggling to establish himself as a dramatist among the best players’ groups in England. He had no aristocratic credentials to promote him, just his own intrinsic ability. His sponsor when the play was first performed was lord Strange, Ferdinando Stanley, son and heir of the fourth earl of Derby, Henry Stanley, a man who also sponsored a group of players. 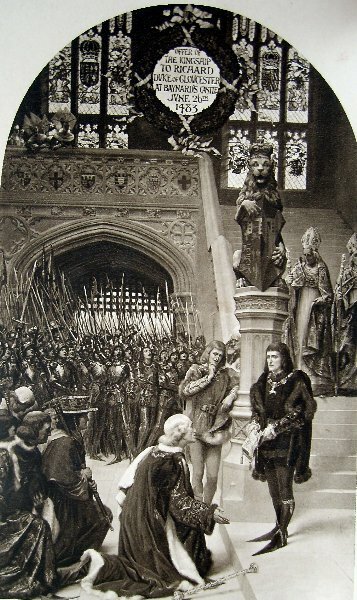 The first earl, Thomas Stanley, was responsible for betraying the last Plantagenet king, Richard III, and placing the crown of England on the head of Henry Tudor, creating him king Henry VII. It is peculiar that the young playwright decided to write a play pregnant with danger by commenting on events pertinent to the Tudor dynasty, particularly when the current monarch was the granddaughter of Henry VII. Shakespeare was dealing with subject matter that would be scrutinised intensely by lord Burghley, Elizabeth’s chief minister, and others for signs of treasonable content. This was thin ice indeed. In Elizabeth’s reign the subject of the dubious Tudor bloodline was death to comment on, so what caused Shakespeare, yet to make a name for himself, take on a subject he could easily, and pragmatically have left well alone? In the years after the Battle of Bosworth and the death of king Richard III, there were several revolts with the objective of removing Henry Tudor from the throne. He managed to overcome these and many who sided with him at Bosworth soon came to regret their decision. Sir William Stanley, the one who led the charge that perhaps mistakenly toppled King Richard was himself caught up in a plot to depose Henry, the man he claimed to have helped to the throne. He was subsequently beheaded. Many nobles fell victim to the dictates of the Star Chamber and excessive taxation. Then in the following reign, his son Henry VIII broke with the Pope in Rome, declared himself the head of the Church in England, and plundered the former monastery lands thus bringing upon himself and his house the opprobrium of his fellow English Catholics. Even worse, his daughter, Elizabeth, went a step further and finally established a Protestant Church of England, which forbad the practice of Catholic doctrine. We can see from this that there were plenty of people in England who were less than enchanted with the Tudors and many of them were in the audiences of the playhouses. Henry VII had attempted to establish a royal bloodline by marrying the daughter of king Edward IV, Elizabeth of York. The problem here was that she had been found to be illegitimate, the marriage of her mother, Elizabeth Wydville to king Edward IV being bigamous. As the legitimacy of Henry’s claim was also dubious this was serious and he attempted to rectify the problem by destroying the evidence. All copies of the Titulus Regius, the document produced by Parliament setting out the circumstances of Elizabeth of York’s bastardy, along with her other siblings including the two princes, Edward and Richard (the princes in the Tower), were ferreted out and burned. The problem here, though, was that the content of the document was well known, and Henry could hardly purge the knowledge from the collective minds of his subjects. Those in an Elizabethan audience would have known of the events before and after Bosworth; they knew perfectly well the dubious lineage of the Tudors and it would have passed by word-of-mouth through families. Those who had Catholic sympathies had good reason to preserve this knowledge. It justified perfectly their opposition to Tudor rule whatever the religious question or other rights and wrongs might have been. Evidence suggests William Shakespeare was a Catholic; so was his sponsor, lord Strange. We know this because in 1593 Ferdinando was the object of a plot (the Hesketh Plot) to murder Elizabeth and place himself on the throne as a catholic monarch. Ferdinando declined to be a part of it and it seems was afterwards poisoned for his refusal. His father, Henry Stanley was ostensibly a Protestant, being a prominent magnate with a wish to hang on to the family fortune. This was similar to the position his forebear the first earl had before Bosworth (Thomas, lord Stanley, not yet an earl as depicted fictionally by Shakespeare). During the battle lord Stanley held back his own forces, which should have been on the side of king Richard letting Henry Tudor win by default. He was rewarded with his earldom for doing so. Here, then, we have the reason why William Shakespeare wrote the play Richard III. He had created for his sponsor a caricature of Richard, a crouchback with a withered arm who had come into the world half made up, legs first and complete with his teeth and a full head of hair. In case the audience had not understood that here was a villain, he tells them so in his opening lines. Anyone of the queen’s faction would have been satisfied with this portrayal, thus ensuring the play’s performance. Those in the audience who were Catholic would view the scene quite differently. They would recognise the absurdity of the character and thus would understand the underlying tone of the work – none of which is true! Were the Stanley’s up to their old tricks of playing both ends against the middle? If we look at it from their point of view, should a Catholic monarch take the throne of England, (not an impossible objective in the final uncertain years of Elizabeth, a Protestant queen without an heir), then they could show how they had sponsored a play whose author had been working subversively to ridicule the hated Tudor crown. If a Protestant monarch won through, then no harm was done. There is a painting by Holbein in the National Gallery, London, called “The Ambassadors” involving a trompe d’oile, or more precisely oblique anamorphosis. A hideous and unintelligible shape in the bottom centre of the painting reveals itself to be a human skull only when viewed from a particular angle. The viewer must seek out a specific viewpoint for the image to appear. Taking a conventional view merely presents the observer with a distorted monstrosity. Shakespeare’s Richard III works on the same principle; you simply have to look at it from the appropriate direction. Here is a link to the Richard III Society Web Site.